Flannel sheets, a persistent downpour, & no leaks in the roof (knock on wood): if that’s not a recipe for a blissful weekend nap, I don’t know what is. Eventually you’ll have to wake up, though, & when you do, you’ll be hungry. How about an excuse to turn on the oven? It makes the kitchen feel so toasty! Put a pot of pasta water on the stove to boil. Toss it all together & spread in a single layer on 1 or 2 baking sheets (I used 2). Roast for 10 minutes, then stir & turn the stuff. If it seems dry, drizzle more olive oil on. (I also consolidated onto 1 sheet at this point, because the veggies had shrunk so much & I wanted them snuggled close together for moisture.) Turn the oven down to 400 & put back in for another 8 minutes or so. 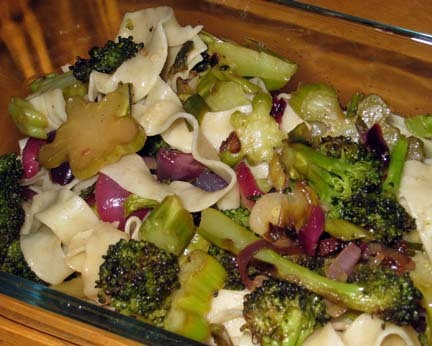 During this second half of the roasting, boil your fresh lemon fettucine, drain it & plop it into the same big bowl you had from mixing the veggies together. (Please don’t tell me you washed it already!) Toss it around with a bit of olive oil so it won’t turn into a solid sticky lump while you’re waiting for the veggies to be done. Around 8 minutes, check the veggies. I squoze half a lemon over them & stuck them back in for another 2 minutes. After they were all done, I squoze on the second half lemon; you want to do this while they’re still in the baking pan, since the lemon juice will have a deglazing effect on all the yummy onion bits that are stuck on the bottom. Then throw it all on top of the pasta, mix together & eat! Edited to add this variation: I went to cook dinner for my mom, since she broke her foot (aww). She happened to have some nice fresh crab that her neighbor gave her (so don’t feel too sorry for her), so I added that to the recipe & used Old Bay seasoning instead of garam masala. Since the asparagus is here (yay!) I also threw in some of that, sliced. I added the asparagus at about the 15-minute mark, & the crab just a couple of minutes before the end since it was already cooked. Also threw in a can of garbanzo beans (at the very beginning w/ the broccoli & onions). Delish!